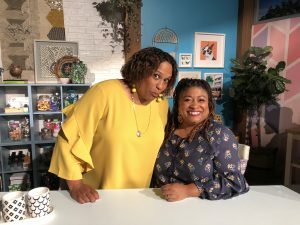 In this episode of “Surviving to Thriving: Overcoming My Darkest Moment,” I talk with daytime talk show hosts Frances Callier and Angela V. Shelton, better known as Frangela. Best friends, living near each other in LA, Frances and Angela share just about everything… even a car! Their darkest moments, however, are quite different. Angela came from a family of strong women, referring to their tight group as the “isle of women.” So when a romantic relationship turned her into someone she didn’t recognize, she took a hard look at the choices she made. She also had to confront her shame around giving up a dream trip to Europe to follow her boyfriend to New York for a job at Saturday Night Live… only to have him avoid contact with her. For Frances, it was dealing with her mother’s stage 4 ovarian cancer diagnosis and what that would require of her. Not only did she have to deal with sorrow deeper than she imagined possible, but her brother revealed that death can bring out the worst in people, so unfortunately her relationship with her brother was lost as well. But Frances learned she had a fortitude she never thought she had, and after moving her mom out to LA to live with her, she ended up living two years longer than expected. Today Frances and Angela bring their positivity and humor to their talk show “Me Time with Frangela,” a newly-released comedy album called “Resist” and their podcast “The Final Word” on Westwood One. Learn more at Frangela.com.